Passing his life watchful over the nous. Our Venerable Father Nephon was born in the village of Lukovë, in the Himarra region of the Despotate of Epirus in 1315. His father was a revered priest. From an early age he studied the Holy Scriptures and the Lives of the Saints, and became an erudite polymath. Because he longed for solitude and thirsted to learn about the monastic life, he went to the Monastery of Geromerion (near the town of Filiates) where he entered into obedience under an ascetic elder from Sinai. There he learned the methods of becoming a Hesychast, and the way of noetic prayer. Soon after he moved to the nearby Monastery of Mesopotamos (in modern Mesopotamos, Delvinë district) where he was tonsured a monk, and was ordained to the priesthood at the age of twenty. He did not want to become a priest, and acted as a fool in order to not be ordained, but God found him worthy of the office. After the repose of his elder, Nephon went to Mount Athos sometime after 1335, where he dedicated himself to greater asceticism, under the guidance of the monastic elders Neilos Erichiotes, Theognostos and Maximos Kavsokalyvites, settling in the cave of the Venerable Peter the Athonite, close to the Great Lavra Monastery. He lived here under the guidance of Theognostos for three years. From there he went to the Kathisma of Basil the Great, where he lived in asceticism and prayer for fourteen years. Saint Nephon did not even want to eat bread but fed on vegetation and roots. Some envious ones accused him of loathing bread and from this accusation he easily and quickly justified himself. In 1345, Nephon was the Protos of Mount Athos. 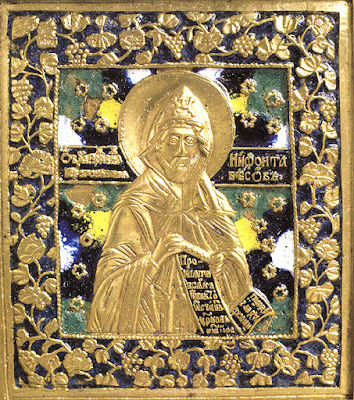 At that time Athos came under the protection of the Serbian Tsar Stefan Dusan, who accused him of ascribing to the heresy of Bogomilism, but he was successfully defended by Saint Gregory Palamas. In 1347-8 Nephon was tried and deposed from his position as Protos after being accused by fellow monks of heresy. He was succeeded by the Serbian monk Anthony. His deposition is regarded as either part of the struggles between rival religious factions that predated the Serbian control of the Athonite community or attempts of Stefan Dusan to gain control of Athos by appointing a Serbian official as its head. This intervention resulted in serious rivalries between the Greek dignitaries and the Serbs of Hilandar Monastery on Athos. During 1355 to 1363 he was again accused of heresy when his servant Bardarios revealed before dying that he had joined the Euchite movement, but he was defended by Patriarch Kallistos I of Constantinople. Nephon was a Hesychast certainly till the end of his life. Nephon was the author of the first biography of Saint Maximos Kavsokalyvites (Jan. 13), his spiritual father. He had lived with Saint Maximos for many years, and their close relationship is indicated by the fact that Maximos, not long before the end of his life in 1365, handed over to Nephon the cell in which he had been living. Nephon described the cell of Maximos, in which he lived for fourteen years, as follows: "His cell was altogether bare of possessions; he did not possess even a needle or a spade or two garments; he had no bread, no wallet, not a single coin." About himself Nephon prophesied that he would die during the Fast of the Holy Apostles. When the day of his death dawned, he said to the brethren assembled around him: "Do not weep, rather rejoice, for in me you will have an intercessor before God for your salvation." Finally, he said: "It is time for me to depart" and he gave up his holy soul to God at the age of 96 on June 14, 1411, glorified by gifts of wonderworking and clairvoyance. 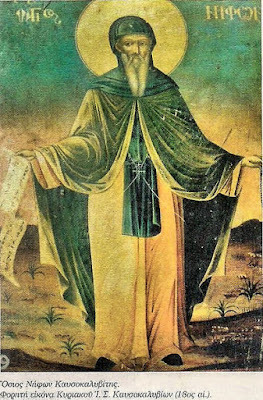 A Divine Office to Saint Niphon exists in the Skete of Kavsokalyva, where the cave of his asceticism can be located, as well as a small chapel in his honor. Offspring of Epirus and shoot of Athos, and the glory of priests, the divinely-possessed Nephon, let us honor with sacred hymns; he exercised the venerable virtues, and was worthy of heavenly graces, illuminating those who cry: Glory to Him Who gave you strength, glory to Him Who crowned you, glory to Him Who through you satisfies all of our requests. In Athos you shined as the morning star, the assembly of monastics, you illumine with your virtues, our Venerable Father Nephon, wherefore you have been adorned with a crown of glory. Unyielding watchfulness always was your delight, you became a visionary, of the immaterial light, which you now enjoy, O God-bearing Nephon, from vain conceptions, do rescue me I pray.